Do you have an old AGM battery? Don’t throw them away just yet. They might still be used after being revived. 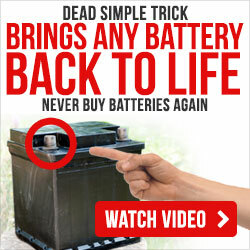 Do you know that reviving dead batteries is possible? With the simple steps that we’ll teach you about how to recondition AGM batteries, you can certainly do it by yourself. Let’s take a look at what an AGM battery is and how you can recondition it for continued use. This professionally used and appreciated sealed lead-acid battery is great for many vehicles. The battery is spill-proof, and the sulfuric acid gets absorbed by the mat placed inside the battery. These batteries have a long life and are capable of providing high power. They have low internal resistance and also do not need a lot of maintenance. The other battery types require recharging every six month which is not the case with AGM battery. They are maintenance free and have excellent electrical reliability. Another side to these batteries is that they are costly compared to the other similar products available in the market. The advantages of longer life do not mean that they never need attention. In fact, these batteries are highly sensitive to overcharging. They lose power over time and do not provide the same strength after some years of service. When the power of the AGM batteries goes down, you may think about throwing them away. But batteries are expensive, and if they are thrown out without using their full potential then it means added cost, and since they are made of acid, it also has a negative effect to the environment. The repairing the battery is not something that requires professional training, and with little maintenance and precision, anyone can do it. (You can learn the basics from here). Many methods can be used to fix an old dead battery. Method 1: This one is one of the best ways for recharging the discharged AGM battery. The technique suggests that you should purchase a modern charger which uses the latest technology to provide the charge. The chargers that are designed especially for recharging AGM batteries have a specific setting and desulfation guide to restore the discharged battery. These battery chargers have become very popular, and they work great on all lead-acid batteries. If you are interested in learning more about lead-acid batteries, then click here. These battery chargers also have the ability to doubling the battery maintainer for the storage batteries. There is also an option of using a ring terminal that can be attached the party externally. This allows the users to charge the battery from outside. This is comfortable for charging by a simple hook up when the vehicle is stored away. Method 2: Another way to restore the dead batteries is by using some of the stocked up equipment in the garage. This technique revolves around tricking the regular charger to provide power to a deeply discharged battery. Now take both the batteries the good and the old one. Connect the positive to the positive and the negative to the negative of the fresh battery and the deeply discharged AGM battery. The charger should not be used at this time. It should not be turned on. Now connect the good battery to the charger and turn the charging on. The charger will check for the voltage on the performing battery and start providing it the charge. Leave the batteries to be charged and connected for about an hour. Do not stop the process but check the deeply discharged battery if it has been warmed up. This could be done by simply touching it. The idea here is to understand if the battery is charging correctly. If the battery is little warm, then it is good and getting a charge. If the battery gets hot, then it becomes a huge problem. You must discontinue the charging immediately if the battery is too hot to touch. There should be no continuation if there is any gassing sound or any other such susceptible situation. It is best not to leave it unattended as there is charging and acid in the battery. A great idea here is to check the battery thoroughly before starting this charge. The clean battery should be wiped off completely before any charging process starts. Safety cannot be ignored at any point. The voltmeter should be used to check how much has the battery charged. Check and see if the AGM battery has reached 10.5 volts of charge. It will take some hours to do this. When you are using let’s say a 10-amp charger, then the battery should take close to 2 hours to reach the voltage required. Now is the time to disconnect the charger from the good battery and disconnect both the batteries as well. Then let the originally deeply discharged battery to pick up the charge directly and continue to do so. Let the old battery get charged for hours until it is fully charged. The charger will show that the battery is fully charged and the battery is fixed to be used in the vehicle. This process can be repeated if the battery is not getting enough charge. Again, be sure to do this process carefully. It is best to do the resuscitating of the AMG battery in an open and safe place. The safety gear which includes the gloves and the goggles should be worn as there is involvement of acid in the process. Hopefully, this article has helped you in trying to revive your battery. The steps on how to recondition an AGM battery is easy to do as long as you follow the steps we have shared with you here. If you have further questions, just send us an email, and we’ll be sure to answer them. Apart from that, we can also send you free information that you can use for your old batteries.